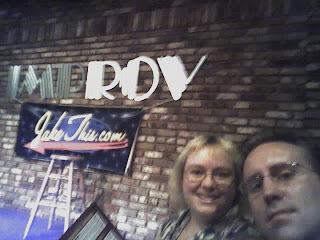 Today we went to see Jake Johannsen (demo reel) at the Irvine Improv. On the drive there we saw 4 Lamborghinis on the 405, and snapped a few pictures. It looks like the silver convertible is a Lamborghini Murcielago LP640, which I wouldn't have even noticed as a Lamborghini if Sandy didn't point it out. The black one is probably a Lamborghini Gallardo. I didn't get a very good look at the orange and yellow ones, but they look the same. 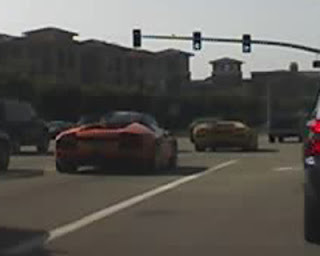 It was quite an experience to drive with them on the highway, not unlike meeting a celebrity at the supermarket (though I have never met a celebrity at a supermarket, so it's just a guess).Someday I want to go to the Lamborghini dealership in Beverly Hills, just to sit in one and get a picture of the experience. They probably don't let you drive them (not that I could, since I can't drive stick shift). So we made it there and saw his performance, which was very good. He's one of my absolute favorite comedians, along with Mitch Hedberg. Maybe Dane Cook, too. I first saw him on his HBO special, This Will Take About An Hour, which needs to come out on DVD so that I may purchase and watch it (I guess they do have it broken up on YouTube). I thought he was fantastic- he has a great sense of timing, and a hilarious outlook on the world. 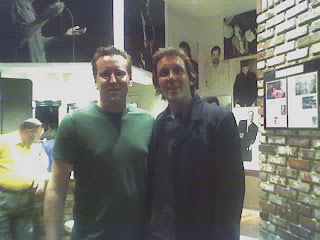 After the show, I bought his CD (which he autographed) and got my picture taken with him. So in all, a great evening.